Mess Cat’s angel she got years ago from our Aunt. I have been looking on eBay to find one just like her. She brings back wonderful memories of Christmases past. It was about the same time as my visit with her that we decorated our tree. 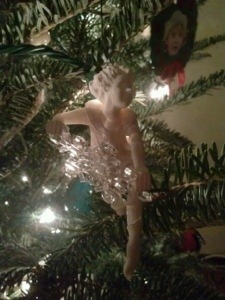 I found one of my ornaments from childhood. He is one of my all-time favorites. Our spirited Aunt, Daddy’s brother’s wife, used to give us all Hallmark ornaments at Christmas. Confession time–I don’t remember being exceptionally excited about the gift. Don’t get me wrong, I was thankful and I did think them beautiful and cute and fun to see, but I’m afraid the stuffed animal or tape recorder (oh what a Christmas that was!) garnered more attention from me. One of my all time favorites. He spins around inside of the snowflake. Just awesome. the ornaments I still have. (And okay, a few of the stuffed animals too.) But that’s it. As I grew older, I appreciated the gift of the ornaments more and more. What a treasure! 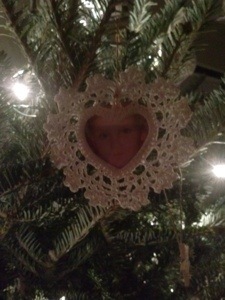 To look back and remember putting the same ornament on the tree year after year. Now that’s a grand tradition. From Aub’s Christmas Number 5. Thankful to my friend who started us collecting ornaments for Aub. When Aub was a baby, my friend, who had a little guy only six weeks older, started the Baby’s First Five Christmases ornament collection for her. And another tradition was begun. Each year, even when we were on our own, I picked out an ornament that held significance for that year. A few years in there my Great Aunt gave her one as well. 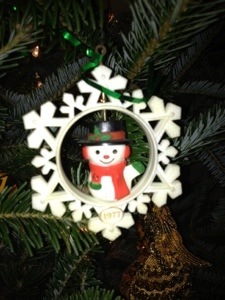 As we pulled the ornaments out to put on the tree this year, I found myself waxing nostalgic. In just a few years most likely these sweet and funny ornaments–the old fashioned dress shoes that open, the little dolls, the fairy collection, Barbie and her sister sledding, the Christmas mice, the five little bears all numbered as they grew–they won’t be on my tree anymore. And I’m okay with that. It’s the reason I started the collection. So she’ll have ornaments to look back and remember with one day. But still…..I will miss them. Our tree is a mashup of personalities as there are ornaments that represent each one of us and our quirks and meaningful moments. From the Fella’s “Christmas Vacation” collection to a Manning boy football player for me (does it really matter which one?) to Princess’ ballerinas to Cooter’s newly begun collection of Star Wars ornaments, and of course, the ones Aub has gotten over the years–guitar, Hoops and Yoyo, the mouse in the silver cup. It is fun to reminisce each year. 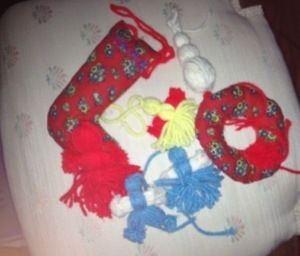 Especially the homemade ornaments. Mess Cat even has one that Aub made when she was quite small on her tree. Aub, when she was quite small. 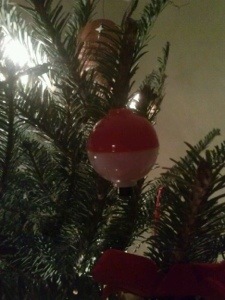 And then there’s the whimsical, like the fishing bobber we got from Go Fish, fishing with Santa last Sunday. Love it! The ultimate fishing ornament–can be used year round. Some of my favorites though are 46 years old to be exact. Mama and Daddy married on December 17. They didn’t have a whole lot of anything. I think they were renting a little place in Valdosta where they were both in school at the time. Newly married, not much to their names. Definitely no Christmas ornaments. So they made them. 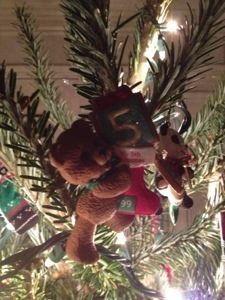 My most favorite ornaments of all–the ones Mama and Daddy made their first Christmas together. These precious little yarn people have graced our trees at Blackberry Flats for a long, long time. I like to think about Mama and Daddy working together to make these sweet Christmas people. I wonder which creative genius came up with the idea? After all, this was back in the days before Pinterest. Practically the dinosaur age, right? Once Mama stopped putting up a full size tree, she passed them along to me. I adore them and cannot figure out how they have held up so well all these years. I loved finding each couple hanging separately on the tree. The fabric ones Mama made with fabric left over from making me clothes. I had a skirt made from this fabric–Aub also wore it when she was two. I think our rocker cushion might have been made from it as well. I love the embroidery on the stocking. (Obviously these were made a couple of years later.) Such a wonderful story and example of the beauty of Christmas being found in the simple things. 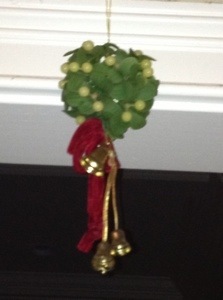 Oh ho, the mistletoe, hung where you can see….. It hung year after year after year above the door to the laundry room which led to outside. No one came in that house that didn’t pass under that mistletoe (some of the newer additions to the family had to duck under it), and Mama/Maemae would be standing there with her arms out, ready to give whoever it was a great big hug. Oh that mistletoe. It almost feels sacrilegious for it to hang in my house. And yet it must. It’s not Christmas without it. And the best Mistletoe. Story. There. Ever. Was. Years. Ago. Before the Giant started fighting with Daddy. Before so much that has happened ever did. It was a joyful time, and my cousin B had come over. I think it was when he was leaving he found himself standing under the mistletoe. He’s always had a great sense of humor. He looked at Daddy standing in the kitchen, spread his arms wide, looked up at the mistletoe, then back at Daddy, and said, “Uncle Bill!!!! !” Daddy did not miss a beat. He called my cousin’s name, strode straight over to him, gave him a great big hug and a big ol sloppy kiss. And the rest is history. We laughed and laughed. Actually, I’m still laughing over that one. Tonight I am thankful for industrious, creative, and generous parents who made beautiful, long-lasting Christmas decorations with love and patience, and who shared them and their stories with me. I give thanks for my siblings who let me have the rest of Mama’s Christmas things–all the things she and the children would put out together each year around the first of December. And I give thanks for my spirited aunt and my friend who, years ago, knew something that it would take me years to learn and appreciate–the gift of an ornament is more than merely a decoration, it’s the gift of memories collected year after year after year. And that is where the real treasure in them lies. Oh Christmas tree, you are full of the stories, aren’t you?